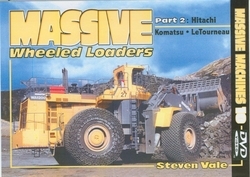 The second installment of Diamond Farms’ series on the largest present-day wheel loaders covers the Hitachi ZW550, Komatsu WA500, WA900 and WA1200, and LeTourneau L1000 and L1400. Other machines shown include Fiat-Allis FR20 wheel loader and FL20B crawler loader, Terex O & K RH170 hydraulic shovel, and Hitachi EX800 and EX870 and Komatsu PC800LC backhoes, along with Cat and Komatsu end dumps. Filmed in Norway, Belgium, Italy and the U. K. Playing time approximately 75 minutes.